The 54-year-old will reach 499 Premier League games as a manager when he sends his relegated side into battle with champions Chelsea at Stamford Bridge on Sunday, and while his future on Wearside remains a topic for debate, he has his sights set on many, many more. 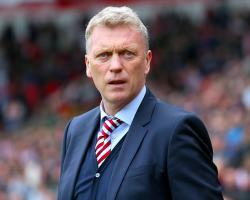 Moyes said: "I'm incredibly ambitious to reach that and I always think in football management, the best is yet to come. "I've had some good times and I've certainly had bad times this year, that's for sure, so I'm looking forward to getting those good times back again. "I'd like to certainly get over 500 games in the Premier League - and I'd actually like to get over 1,000 games in football management, which is I think a target a lot of the managers are now setting, and there are quite a few who have already achieved it." In the short term, Moyes faces the task of trying to restore some of Sunderland's battered pride by spoiling Chelsea's party. Antonio Conte's men will receive the Premier League trophy after the game and will be looking to finish their glorious campaign in resounding fashion, and Moyes is hoping some of their success will rub off on the youngsters he could be forced to include in the face of a late-season injury crisis. Moyes said: "Maybe seeing what it's like to be winners, maybe seeing what it's like to be champions can influence some of the players. "Mind you, we have got a lot of players who have got Premier League experience here, but maybe some of the younger players who will get a chance to have a look at it will see what it's like and hopefully those times we can have in the future. "In the main, Chelsea have been worthy champions - but I think in the early part of the season, there were a few questions being asked. Moyes could be without an entire team of injured players for the game with Lamine Kone and Didier Ndong having joined Papy Djilobodji, Jason Denayer, Paddy McNair, Jan Kirchhoff, Wahbi Khazri, George Honeyman, Steven Pienaar, Duncan Watmore and Victor Anichebe on the casualty list.